Hi, I am interested in your 1969 Chevrolet Chevelle (stock #4662-ATL) listed on Autotrader for $25,995. I'd like to get more information about this vehicle and confirm its availability. 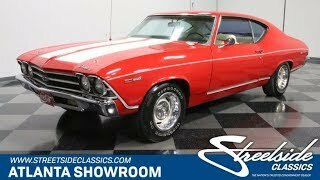 If youre yearning to get behind the wheel of a true classic, but are a little torn as to whether or not you want to go with a thoroughly stock configuration or add some mods, youll want to check out this 1969 Chevrolet Chevelle Malibu. Its been lightly driven of late and carries a strong V8 under its hood to go along with a very solid underpinning that would serve equally well as a foundation for future customization or for plenty of enjoyment just as it stands. As a 69, this Malibu carries all those stylistic refinements that were heaped upon the model as its second generation debuted, including a sloping, semi-fastback rear roofline and a much more tapered exterior than its predecessors. Dressed in a properly vintage shade of red, it cuts a striking appearance just as it is, and a little attention in the form of a multi-stage detail would ratchet this Chevys head-turning capabilities even higher than they already are. Most of the other aesthetic boxes are checked - the overall exterior alignment is looking precise, both the front and rear bumpers as well as the rest of the trim are in strong condition, and the broad white stripes running the lengths of the hood and deck lid still have their consistent coloring and sharp edges. Take a lap around this classic and youll also notice that the tinted glass surrounding the cabin is very clear and its array of badging is securely in place and looks nice and sharp. Somewhere along the line, the interior was refurbished and appears to have been treated with respect ever since. It remains in its original factory configuration and parchment color and shows only the slightest of wear. The vinyl bench seats in both front and back have held their original form well and offer plenty of comfort for even the longest of road trips as they sit over an expanse of contrasting black carpeting, while the enticing grip handle of the Hurst shifter sits within easy reach, calling for you to grab ahold and take a run through the gears. The door panels to each side still cling firmly to their surrounding steel frames and the dash area is still solid - the pad running across the top shows no splits or marked sun damage and, though the gauges inside the instrument cluster would benefit from a fresh lens, thats sure not the most difficult of fixes. An aftermarket AM/FM/CD stereo has been installed nicely in the center of the dash and it teams with a subwoofer situated in the trunk to provide a powerful audio experience. The 350 V8 residing in the engine bay is very much ready for action. Its running smooth and strong and wears an Edelbrock 4-barrel carb and intake manifold for some increased power, as well as a pair of long tube headers that send the powerplants rich note out through the dual exhaust. A chrome Edelbrock air cleaner and matching valve covers add their eye candy to the compartment. The 350 teams with a 4-speed manual Muncie M22 transmission to provide a hands on driving experience befitting a muscle car icon like this. By the time this 69 greeted the public, Chevy had already done away with leaf springs in back on their Chevelles, and the coils that replaced them provide an improved ride, with none of the previous binding or chattering when turning corners. This eye catching Chevy classic cruises on a set of stock 15 wheels outfitted with Firestone Firehawk SS tires. Second generation Chevelles like this 1969 Chevrolet Chevelle Malibu have been sought after by muscle car enthusiasts for decades and this ones reassuringly strong running condition is a major plus. Call today!